This past Saturday, my mom and aunt flew into town. The next day, we headed off to Orcas Island for a day and two nights, and then came back into Seattle on Tuesday. Since then, I've been focusing on school auction work and the upcoming filming of the promotional storytelling video. I know! I sound like a skipping CD* with nothing new to report. I have been enjoying the family visit, though. My mom is leaving Seattle tomorrow afternoon and my aunt on early Saturday morning, and I will miss them both. As I type this, my mom is working on a moss maiden, having been inspired by my doll-making of late. I tried to resist. I really did. I went through all the usual reasons as to why it was prudent that I let someone else discover them. But then, I knew I'd be sad if I let them go by. 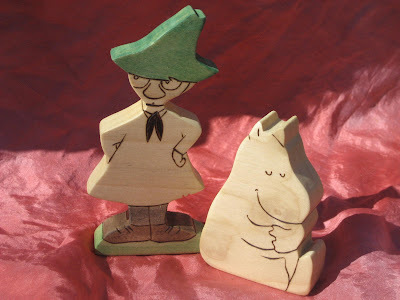 And so, Snufkin and Moomintroll will grace our spring nature table. "It's the right evening for a tune," Snufkin thought. A new tune, one part expectation, two parts spring sadness, and for the rest just the great delight of walking alone and liking it. Awww! Thank you Farida! I love the Moomin books so so much. They are quirky and strange, but so inviting and I love that they are so unique. Often Snufkin plays his mouth organ. A tune to match the mood of the moment. Thank you for inspiring them! I will make more so others can be introduced too! The world is a better place with these two characters around for storytime. I learn so much about the Waldorf world just from hanging out here. I love the names of the characters -- part Scandinavian, part whimsy. You give so much joy to others; it's right that you take some for yourself. A moss maiden sounds lovely! 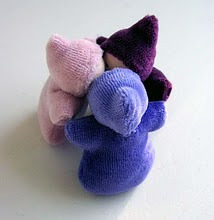 I have finally found a decent source for wool felt here - I hope - now to save up for some! 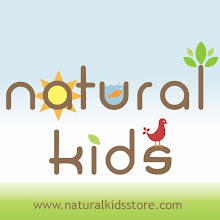 Do you know of any online resources / tutorials / patterns for your nature dolls to inspire me while I am waiting? That's awesome. I must read the Moomin books one day, too. Hey all! I just finished my first two batches of edits! Woo woo. I'm done until I get the next batch. I'm taking a break to visit the Little One Meadow (Lucia's Little One, Snowdrop, had a big bath and now needs her hair doozied up once more by Dahlia). Then, I need to focus on the storytelling video. Perhaps tomorrow I'll get my book reviews done. Thank you for all of your kind words. 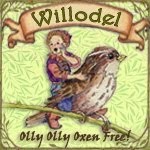 Schelle, I don't know of any online resources for my nature dolls, but I can refer you to Sybille Adolphi's book Making Flower Children. If you can't get ahold of the book, please email me (there's a link in my profile), and I'll tell you what I know. The only trollish natured comments you'll hear from me are about Moomintroll. I read my first Moomin book when I was five and re-read in many times over the next twenty years. A joy to discover when I came to the US that there were more books. My favorite(s) are Moominpappa at Sea and Moominvalley in November, partly because they take place at exactly the same time but in different locations but mostly because they are about the joy and sorrow mixed of coming of age and finding oneself no longer a child (even the grownups go thru this sea-change). Keith: Those trollish comments are definitely welcome. :) Thanks so much for stopping by my blog. You remind me that it's about time for me to reread the books.